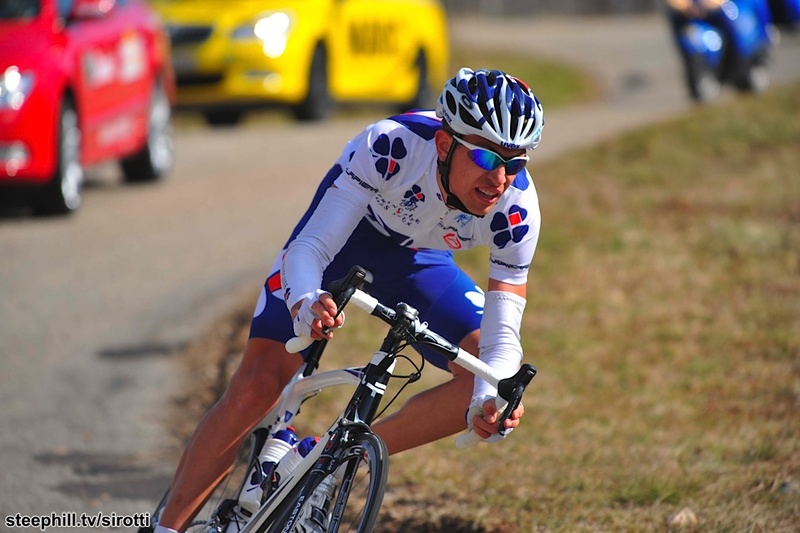 Luis Leon Sanchez (Spa) has thrilled bike racing fans during the last two editions of Paris-Nice. 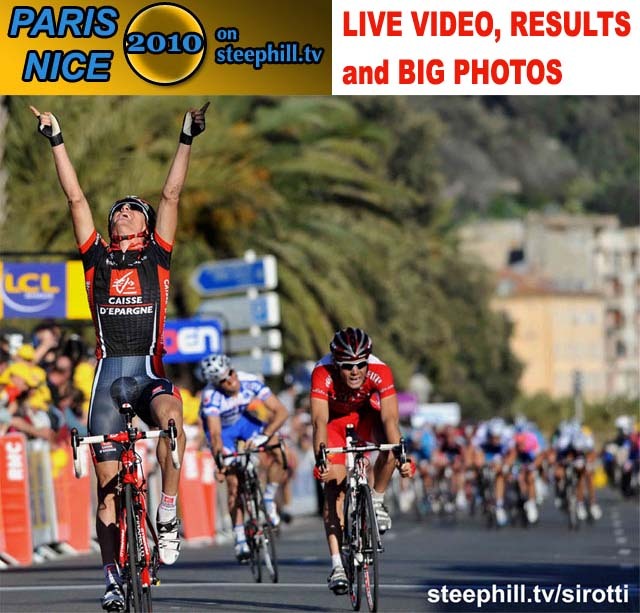 Last year in 2009, he notched a solo mountain stage win that was instrumental in his overall win and two years ago (pictured here) he hung on for a solo win on the last stage while descending the final mountain and flat finish into Nice. 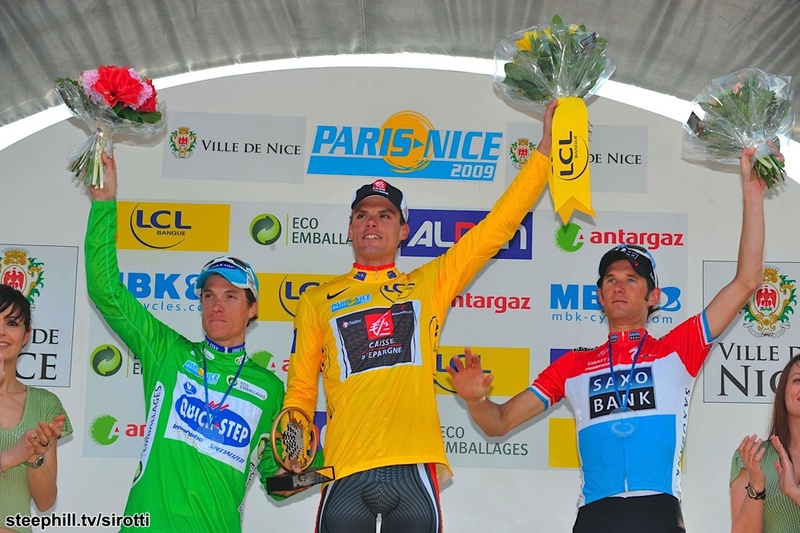 GC Podium: L-to-R, 3rd Sylvain Chavanel (Fra) Quick Step @1.09, 1st Luis-Leon Sanchez (Spa) Caisse d'Epargne, 2nd Frank Schleck (Lux) Team Saxo Bank @1.00"
Cycling's version of March Madness continues with Tirreno-Adriatico overlapping Paris-Nice. The best sprinters will be there as well as lots other big names. 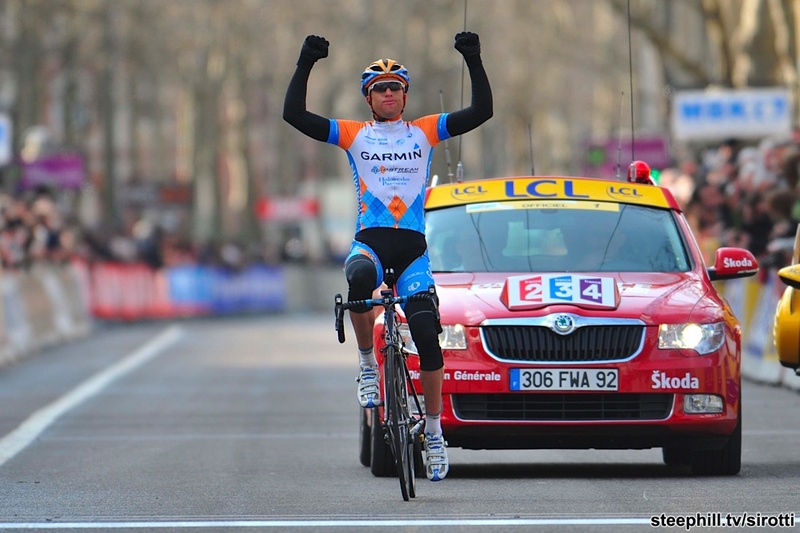 Cycling's version of March Madness starts today with Tirreno-Adriatico overlapping Paris-Nice. ALL the best sprinters will be there. 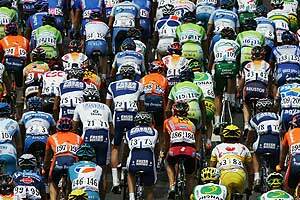 In fact, overall, it will have a better field than Paris-Nice. March 8 update: Looks like it will be raining and windy for the opening stage today. A fitting way to start Paris-Nice. Last year, it was raining in Amilly for the prologue as well when Tyler Farrar's crash was skillfully captured by a spectator ( ). If David Millar is hoping to win the GC then he'll be looking to win this rare Paris-Nice time-trial stage. 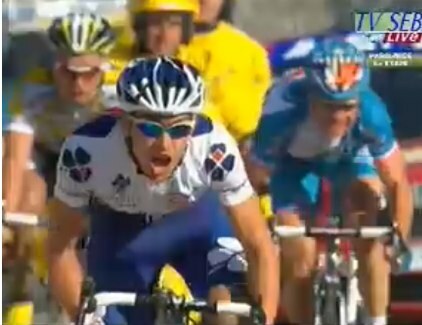 "Wiggins or Millar for the win today in Paris-Nice? Not sure, but I hope one of them will win" says JV. Personally, I'm not keen on time-trials in week long stage races. They are usually too decisive, but this is a short one... just barely longer than the maximum prologue distance (8 km). Adding to the usual confusion of calculating time zone differences is the fact that Sunday 2 AM is the start of daylight savings... at least in the U.S it is. Lucky for your sake, I have it all figured out below regardless of where you live. 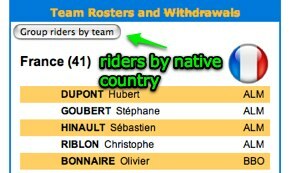 BTW, Christian VANDEVELDE is confirmed for Paris-Nice, but he's listed as a reserve on the official startlist. Francesco Chicchi is apparently a DNS. 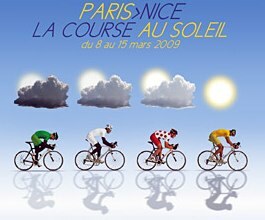 Saxo Bank for Paris-Nice: Jens Voigt, Gustav Larsson, Fränk Schleck, Karsten Kroon, Alexandre Kolobnev, Jakob Fuglsang, Chris Anker Sørensen, Nicki Sørensen. 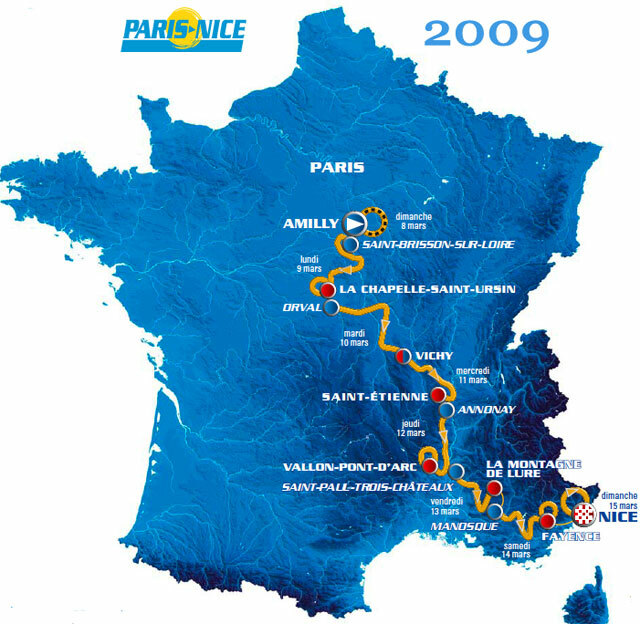 Spelling variations of Paris-Nice depending on the language: Paris-Niza (spanish), Parigi-Nizza (Italian), Parijs-Nice (Dutch), Paris-Nizza (German).